I have bought and reviewed many of the Leisure Arts booklets over the years and when I found this one, I was keen to get my hands on it! 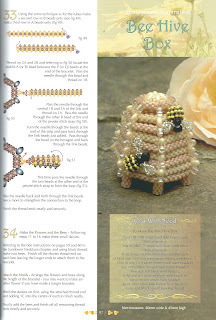 This publisher specialises in craft techniques and you can choose from a variety of titles covering everything from crochet to quilting. Many contain projects written by a single designer whilst others (like this one) are a collection of tutorials from several designers. This is classed as a booklet rather than a book as at 32 pages, it is quite thin! However, packed into the pages are 16 different projects to make from rings to earrings, bracelets and necklaces. 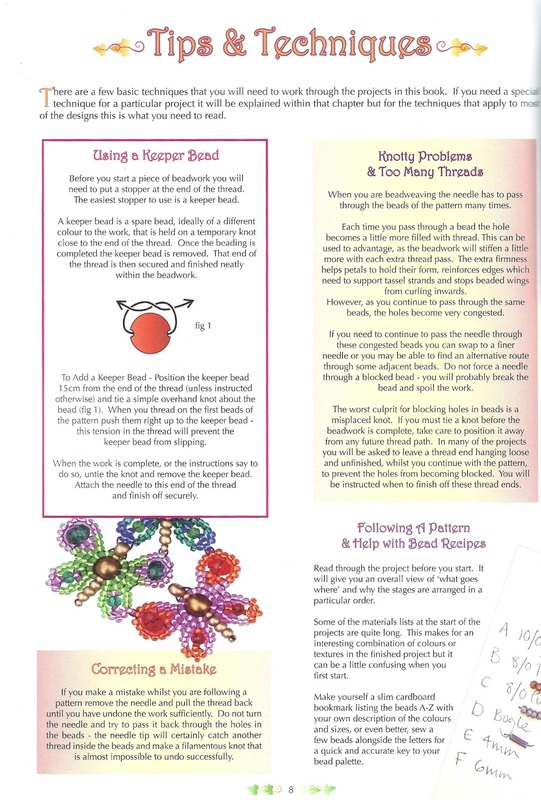 The first page is a visual reference to the tutorials (as is usual in these booklets) and is a quick indication of the variety of designs and styles you can choose from. 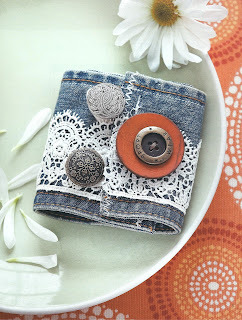 One of the first projects to catch my eye was a denim cuff that uses buttons to both fasten and embellish. I love to find designs that allow me to combine different crafting mediums and also opportunities to recycle and re-use materials. I am not accomplished at sewing but I do like to incorporate fabric into jewellery as it is a wonderful source of texture and is so comfortable to wear. 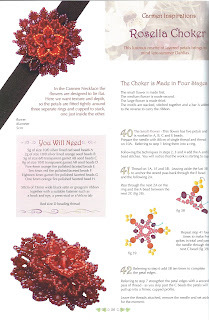 There are several projects in this booklet that require a small amount of sewing or that add ribbon to the mix. Looking through the designs included in this collection, I started to think about how easy the projects are (and how inexpensive to make!). I think this book would make a lovely gift for a novice jewellery maker (I know my thirteen year old niece would love it! ), especially if you included a bag of beautiful buttons to get them started. Just look how easy this sparkly button bracelet is! 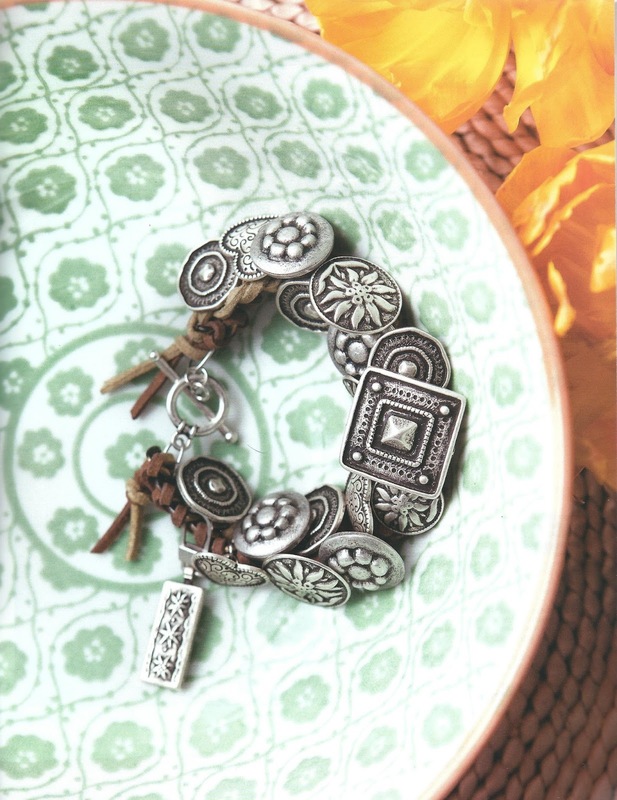 By the time I reached the last pages of the booklet, I was already planning my own button bracelet. 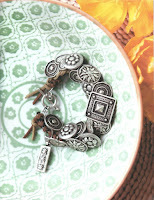 I knew I had some of the pewter coloured buttons used in this design that also uses leather thong for a rustic look. When I looked in my stash, I found a range of metallic buttons that I remember buying from Totally Beads at the Hobbycrafts show a few years ago. However, I also found some rather lovely vintage beads that I'd forgotten all about. I bought them in a charity shop (always check the button basket in your local thrift stores!) a long time ago just because they were so pretty. Teamed with some brown toned simple buttons, I love how my design turned out! 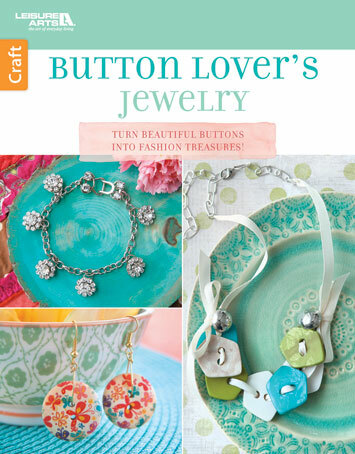 Button Lover's Jewelry is published by LeisureArts and is priced at just £5.99 (that's less than 40p a project!). It's available to buy from GMC Publications. In the fourth in our series of posts on creating unique jewellery displays, I'll show you how an eclectic mix of frames can be transformed into a beautiful collection of earring stands. I have been collecting miniature frames in charity shops and junk shops for a while now. Some are quality vintage frames in brass with intricate casting (with and without glass). Others are contemporary frames in shiny silver, machine moulded with just perspex rather than glass. This collection ranges in size from a couple of inches high to around 4 inches. At this time of year, I am already starting to think about my jewellery ranges for Christmas and the party season. My designs are glamorous and classic and I wanted a display to suit the style.The contemporary frames looked cheap and nasty to be quite honest so I decided to give them a vintage makeover. I've used Gilders Paste for various projects in the past as it is so versatile. You can apply to wood, resin, metal amongst other materials which makes it extremely useful in jewellery making. The paste is a little like boot polish and can become cracked and powdery over time but can easily be rejuvenated it by adding a few drops of White Spirit and mixing in. The paste comes in a huge variety of colours to give every kind of finish you can think of. For this project I used Black and German Silver. The paste works best on a matte surface so my first task was to spray all the shiny silver frames with a matte varnish. Once dry, I used a soft cloth to apply the first layer of German Silver paste to the silver frames. It's a soft gold colour and quickly tones down the horrid modern silver colour. Leave the first layer of paste to dry a little then you can gently buff ready for the next layer. Black Gilders paste is great for adding age to metal components and for bringing out the detail in any relief work. Applied with a soft cloth, it brought out the flower design on my little frames. The frames still looked silver though to I applied another layer of German Silver and another of Black. I left them to dry then buffed to a soft shine. While I was using the German Silver paste, I also applied a light rub to the two vintage brass frames. It really brought the casting to life and helped to bring the whole frame collection together. With the frames done, I turned to the mounts. I used some fabric textured wallpaper (a sample from a local DIY store) to create a background for each frame. A bead reamer was the perfect tool to make a couple of holes through the frame backs and then I used 0.8mm brass wire to make the hanging loops. Cut 10cm of wire, turn a wrapped loop at one end and trim.Pass the wire through the hole you made in the backing and turn another loop of the back of the frame to secure. Loaded with glamorous earrings and displayed with my collection of larger frames, I love the luxurious and expensive look I've achieved. Who would think that most of the frames cost as little as 50p each and none was more than £1?! Why not check out the range of Gilders Paste at Metal Clay Ltd. I think I might pick up a tin of Antique Gold and add a touch of metallic gold to my frames. What do you think? 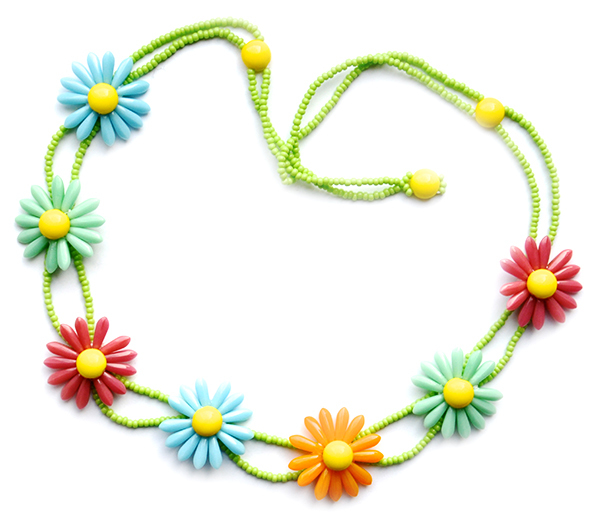 We tried out this kit to make a flowery bead-stitched necklace perfect for an Indian summer. The Jessie necklace kit has a difficulty rating of 6 out of 10 so it's a great project for a beginner to intermediate beader. 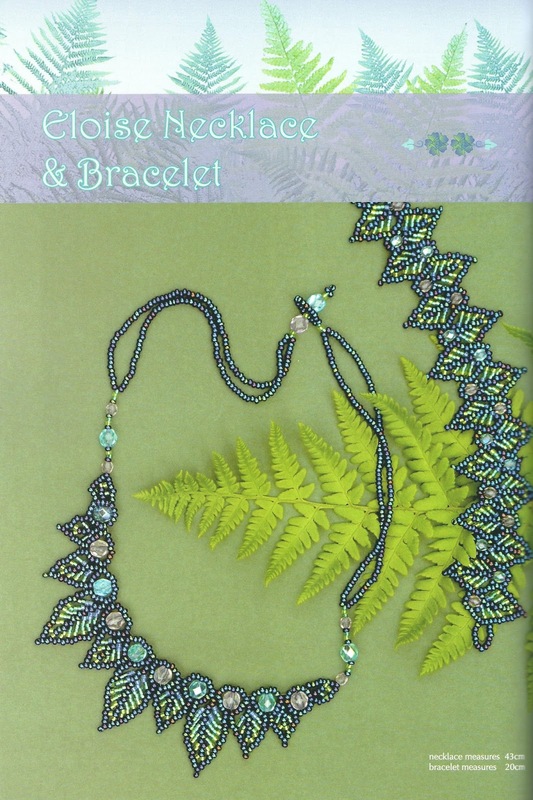 The pack contains all the beads required including some bright and colourful small dagger beads and some interesting 'Candy' beads from Preciosa which are domed on one side and flatter on the other. Also included are clearly stepped instructions and diagrams to keep your beading on track as well as a needle and beading thread. Just add a bead mat, some clear nail polish/glue and a pair of sharp scissors and you are good to go. 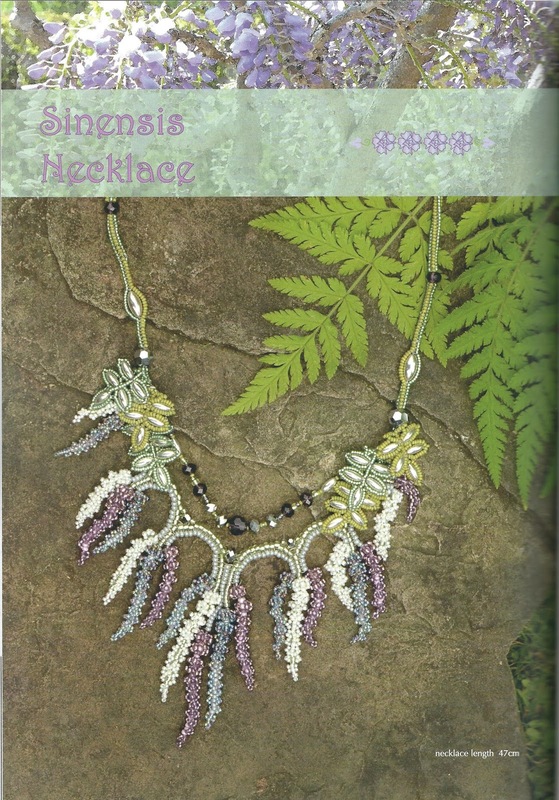 The flowers in the necklace are constructed separately to the beaded strands so it's a nice easy progression into the more complicated parts of the project. I love the colours in this kit but I am already thinking that I'd like to try this design again using traditional daisy colours. Spellbound stock the white dagger beads I'd need as well as the yellow candy beads. I probably still have enough of the green seed beads left from this project! Once the flowers are complete, you link them up in a double chain of green seed beads. I have to admit that I got myself into quite a tangle to start with (the petals are quite spiky and seem to catch the thread very easily). I found the best approach was to keep the bracelet flat on the mat and to keep checking the path of my thread to ensure it didn't get caught. This becomes even more important when you do the second row of linking chain! Here's the finished necklace with an easy bead tag clasp. It's really delicate and pretty. I just hope we get some late season sun so I can get to wear it and show it off! The Jessie necklace kit is £11.50 and available from the Spellbound website. Author Emilie Shapiro sells her jewellery at boutiques, museums and several big-name retailers under her brand ‘Emilie Shapiro Contemporary Metals’ but she started out creating one-off pieces for friends and family as so many of us do! 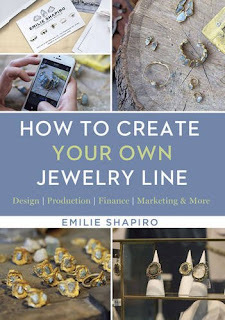 In teaching thousands of students over the years in jewellery production, Shapiro identified a lack of resources to help students to create their own jewellery line. She formulated a business course that provided guidance on everything from designing a coherent collection to marketing it to retailers. This book is an extension of this popular course. As the cover suggests, the book covers everything you need to turn a home crafting business into a successful jewellery brand —design, production, finance, marketing and retail. Starting at the beginning, it discusses the various options available in setting up a company (probably more useful for US-based readers) as well as providing some really great tips on choosing the right business name and logo. Picking a name that is “versatile and simple, and that people will remember” might seem obvious but as Emilie points out it’s also important to choose a logo that will “look great printed on a large sign that is 2 feet wide, yet will still look clear printed on packaging that is 2 inches wide”. Deciding on light and dark versions will also give you ultimate flexibility later. The book goes on to cover all aspects of designing with your brand and production in mind. As Shapiro points out, a different approach is required for many designers. 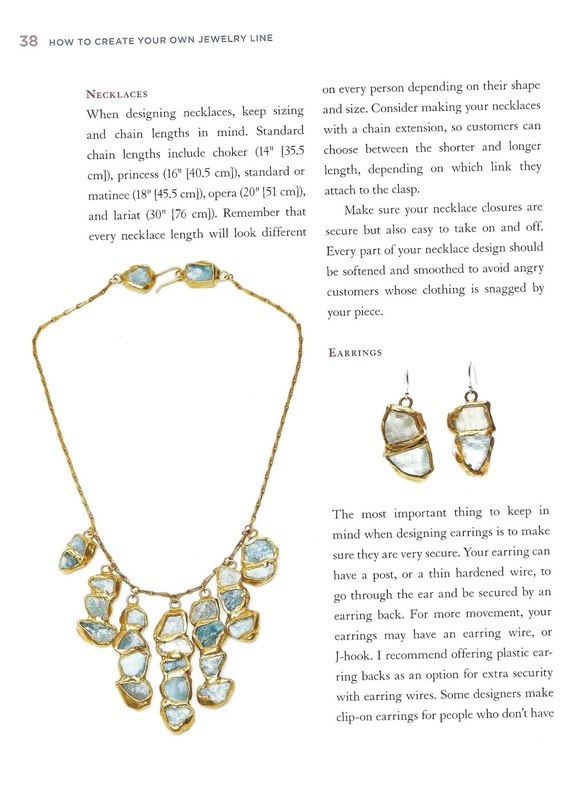 In creating your own jewellery line, the focus is on efficiency over creativity, particularly in designing a collection. 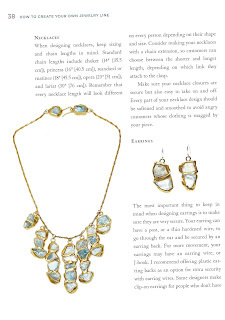 She suggests that you “aim to design ten pieces for your first collection. As time goes on, redesign pieces to make them more functional and saleable, edit out pieces that do not sell and add pieces by expanding on what worked.” It all sounds a little cold and soulless for me but that’s the difference between creating on a small scale and creating for retail I guess! If you can’t quite see yourself pairing back your designs for the retail market and aren’t sure whether you are ready to sacrifice your creativity for the sake of a successful jewellery business you might be thinking that this book is not for you. 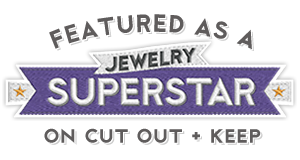 However, there are some wonderful tips and ideas from Shapiro that you could take advantage of, however you create and sell your jewellery. 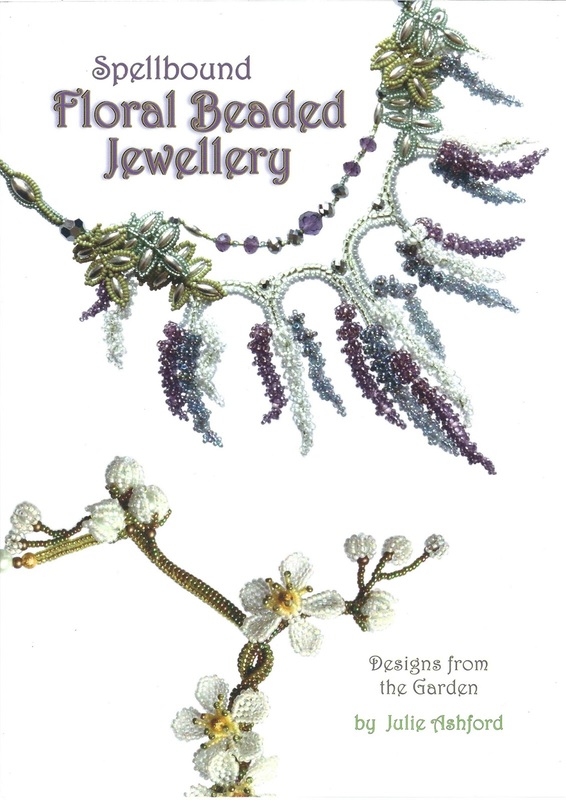 For example, creating artists’ cards and product line sheets are fantastic ideas and ones I will certainly be trying when I prepare my next collection of jewellery for a retail environment. There is also a whole section on pricing your jewellery —something most of us find tricky to say the least. 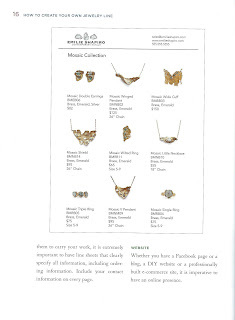 Further chapters cover marketing your jewellery line and how and where to sell your pieces. However, probably the most interesting chapter for anyone seriously considering growing their business to the level that Emilie has achieved, is the chapter entitled ‘Insider guidance from industry professionals’. I found lots of little titbits of information here that I will bear in mind when I next approach a gallery or shop with my work. Overall, this book is a good read with lots of useful hints and information for any jewellery maker. 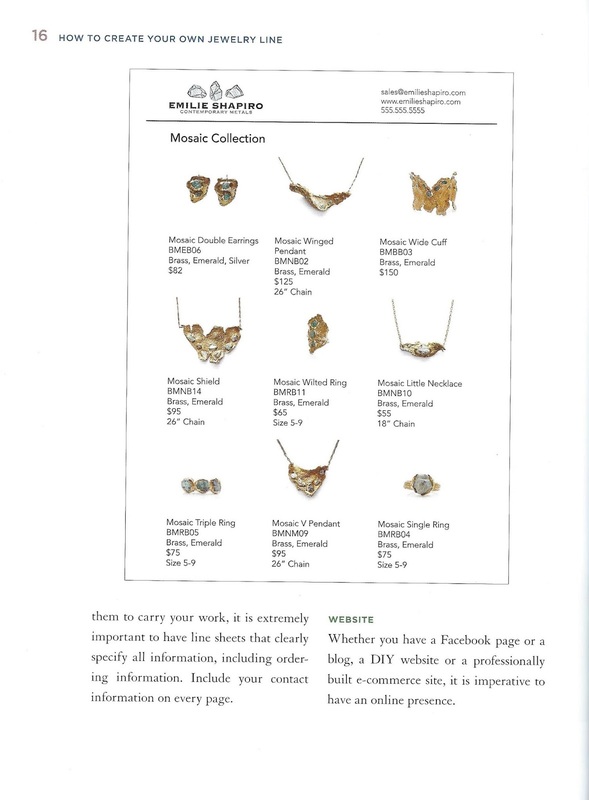 I would say that creators of metal jewellery would find the chapter on producing a collection of particular interest as it covers everything from tools to detailed techniques but there is certainly food for thought for all of us. 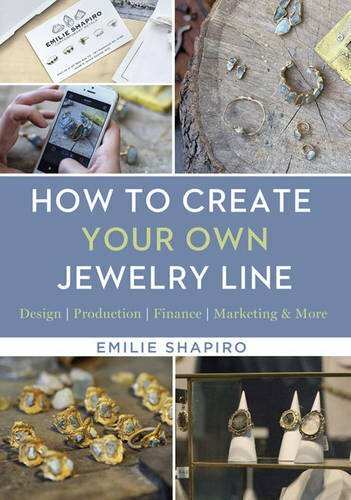 We have a copy of ‘How to create your own jewelry line’ to give away to one lucky winner.Comment on this post to be entered into the draw. We will pick a winner at random on Friday 9th September after midday. Look out for our Facebook post for a second chance to enter and for the announcement of the winner. I always see lots of old photo frames in charity shops. They are often made from dark wood and sometimes are without glass. They can be picked up from as little as 50p and, with a bit of work, can be transformed into pretty earring frames. Keep you eyes open for lace tablecloths in charity shops too. They might have tea stains but that doesn't matter if you are going to be cutting them into pieces! 1. Remove the glass and backboard from your photo frame (if they have them). Lightly sand to roughen the surface. 2. Apply a little candle wax to areas of the frame. This will give the paint a flaky finish by preventing the paint from adhering properly to the waxed area.I wanted some dark areas to show through the finished paint but you can paint the frame with white chalk paint first before applying the wax if you want a lighter overall finish. 3. Paint the frame with a layer of white chalk paint and leave to dry. 4. Apply wax to the frame and leave to dry. Once dry, buff with a soft cloth. 5. Paint the frame with pink chalk paint and leave to dry. Apply more wax and buff once dry. 6. Using fine sandpaper, gently sand areas of the frame to give a distressed effect. Where the candle wax was applied, the paint should have a flakiness which you can encourage with the sandpaper for an even more distressed finish. 7. Once you are happy with the finish, apply one more layer of wax to protect. 8. Cut a piece of lace tablecloth slightly larger than the frame. Staple one edge to the back of the frame then stretch the lace taught and staple the opposite edge. Repeat with the other two sides. 9. Trim any excess material from around the edges of the frame and secure any raw edges by adding a washi tape border. 10. Load your frame with earrings! Resin that's worth the wait! We test out the new slowcure epoxy resin from Resin8. I was really pleased when Kate and Clare at Resin8 asked me to test their new resin. I was running low on my usual resin and was right in the middle of making a whole stack of pendants for a fast-approaching event. I knew I could test out the new product and then put it to work right away! The slowcure epoxy resin is exactly what it says on the bottle – it’s a high quality and crystal clear resin which takes longer to cure than many other resins out there. If left to cure at the correct temperature and humidity levels, you can expect your pieces to be ready in around 19-24 hours. The advantage of this slower curing time is a resin that is less prone to yellowing and that is virtually bubble free. Up until now, I have used the Chemset Resin and Hardener which is mixed by weight in the ratio 2 : 1. The new slowcure resin is a little different in its chemical makeup and so the mixing ratio is slightly different too. It is still a two to one ratio, but by volume rather than weight. Two small measuring cups are provided to you can’t go far wrong, but if you are more comfortable mixing by weight, the instructions also give you the weight ratio of 100g (resin) to 45g (hardener) or 1 : 0.45. This would be fine if you are mixing a nice easy amount e.g. 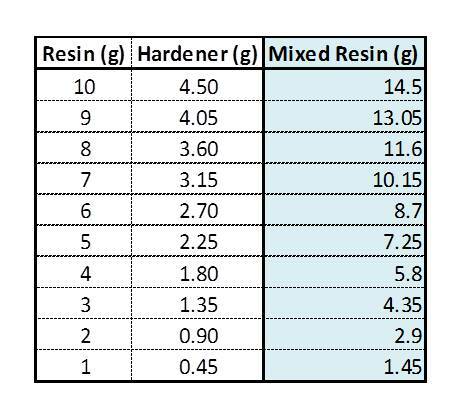 10g of resin to 4.5g of hardener but could mean you’ll need a calculator to work out more complicated mixed resin quantities. 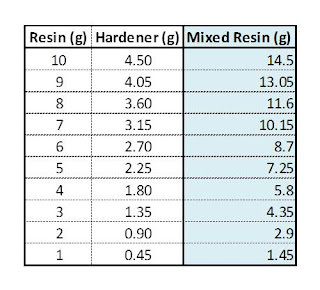 I knocked up a table so I could potentially mix up smaller amounts of resin more quickly and without needing measuring cups (that then need cleaning!). I first planned a few pendants to test how the resin behaved – from a simple clear layer over a mount with a paper insert to embedding objects, and finally to filling open-ended mounts and embedding crystal chatons into the cured resin. The different shaped mounts allowed me to see how the resin travelled into corners and levelled itself. I began by sealing background papers — all resins will get ‘sucked’ up by porous paper unless there is a barrier preventing it. I cut them to size to fit the various silver plated mounts. I prepared my mounts for the resin by sticking in the sealed background papers and gluing in any items to be embedded using two-part epoxy glue. I set them onto acrylic blocks so they were perfectly flat, using Blue Tack to keep them in place. Note: ensure that no Blue Tack protrudes above the rim of the mount, even by a quarter of a millimetre else it will wick the resin right out of the mount and onto your acrylic block, leaving you with a lot of cleaning up to do! All the same safety guidelines apply when using this resin — protect your clothing and work surface, work in a ventilated room and protect your skin with a barrier cream. I measured out 10ml of Resin and 5ml of Resin Hardener (2:1 ratio by volume). I poured them into a mixing pot. You will notice that the resin is milky and streaky when you first begin to mix but it becomes clearer and clearer as you keep mixing. The mixed resin is very fluid. This is good news for getting it into all the corners of your pendant mount and I didn’t need to coax it at all in this regard. I filled the first square mount and any bubbles just disappeared without the need to pass over with a naked flame. The resin doesn’t specify whether it gives a domed finish but it formed a nice rounded surface anyway, perfect for this type of pendant. I moved on to the mounts with embedded objects. The resin flowed really easily around the charms, forming a nice surface as before. To use the watch pendant charm and open bezel pendant, I fixed them to short lengths of wide adhesive tape. The tape forms a seal around one side, allowing you to fill with resin without it seeping out the bottom edges. I filled the watch pendant to create a nice rounded surface around the added vintage watch face embellishment. 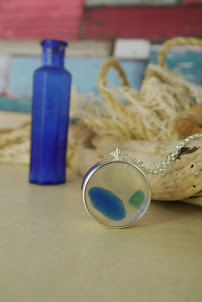 For the round open bezel pendant, I added just a very thin layer of resin to form a clear base. After all those pendants, I still had mixed resin left so I made up two more mounts with a tea theme. The resin will sit quite happily for a long time while you mess around with mounts, background papers and objects to embed so there was no rushing or panicking that it was going to thicken and become unusable. I left everything to cure in a warm and dust-free spot and decided to come back to them in 24 hours. The instructions tell you that the resin will be cured in 19-24 hours however, mine still a felt a little bit tacky to the touch when I checked them after a day. This might have been because the humidity was high in my workroom. They were fine when I checked them a few hours later. I added embedded crystals to one of the pendants and was able to drill nice neat wells in the resin surface using a hand drill. Overall, I was impressed by the new product. I particularly liked the absence of bubbles in filled mounts and the general clarity of the finished pieces. The measuring by volume will take a bit of getting used to, so I may revert to my table and test out measuring by weight instead. I’ll also have to find some patience from somewhere too if I am going to use it for my layered pieces. 19 hours between each layer is a long time to wait! And if you are wondering how my open bezel pendant worked out? I added sea glass and resin in layers to achieve a window effect. You’ll need to sign up to our newsletter to see the finished piece and find instructions to make your own!